Plant Natives for Exponential Kindness to Wildlife. 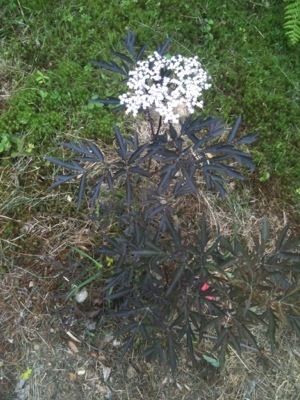 This Blossoming Elderberry is in a garden just north of Saratoga, NY. I planted it last autumn for my client, applauding his native and habitat plant choice. This property is surrounded by a three-quarters crescent moon shaped forest edge, giving the five acres lots of riparian zone activity. It is honestly the quintessential habitat lot: a menagerie of fox, songbirds, raptors, deer, chipmonks, dragonflies, butterflies, coyotes, rabbits, ants and voles quietly and loudly making their living in co-operative or competitive ways. The Elderberry is of course a plant to assist the songbirds in making their living. This habitat plant (and native plant) of the Saratoga- Lake George gardening region attracts and provides food and (when it gets bigger) shelter for our diverse songbird population.